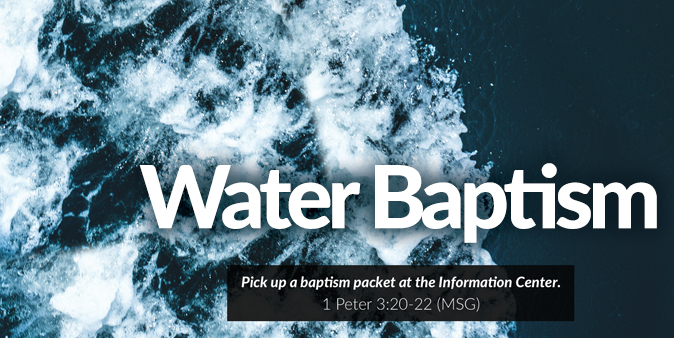 If you are interested in being baptized, please pick up a packet, which contains full instructions, at the Information Center. We will meet in the Green Room at 6:30 PM to prepare. Please bring your completed packet with you. "...You know, even though God waited patiently all the days that Noah built his ship, only a few were saved then, eight to be exact - saved from the water by the water. The waters of baptism do that for you, not by washing away dirt from your skin but by presenting you through Jesus' resurrection before God with a clear conscience. Jesus has the last word on everything and everyone, from angels to armies. He's standing right alongside God, and what he says goes."